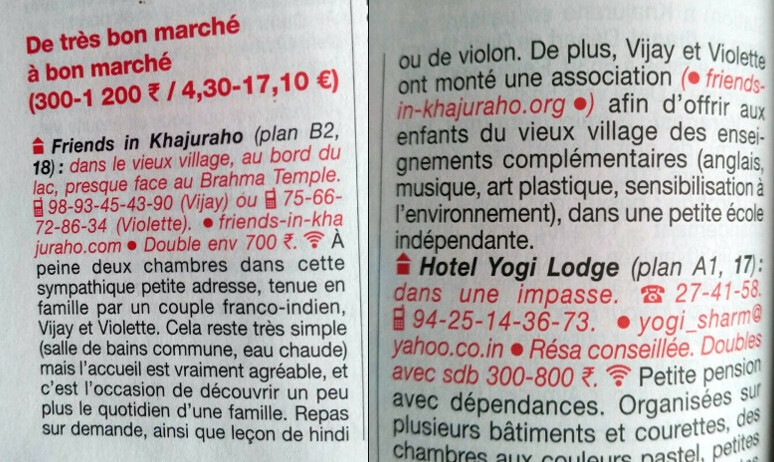 It is very easy to find us, as we are located just before the entrance of the old village of Khajuraho, right in front of the Brahma Temple. If you come from the main market, keep walking along the main (Jain Temples) road; you will pass the old (small) Hanuman Temple on your left. After a “big” crossroad keep on walking straight and into the left-hand side branching of the road that follows the Nanora lake (“Khajur Sagar” on the opposite map). Walk a bit more until you reach the Brahma Temple and we’re the only house opposite the temple. In case you get lost, you can ask anyone for the Brahma Temple! Khajuraho has a railway station located 7 km away from its main centre. If you come from Delhi (Nizamuddin Station) or Agra, you’ll take the “UP Sampark Kranti Express” train (no. 12448) that serves Khajuraho everyday. Coming from Varanasi you will take the “Bundelkhand Express” train (no. 21108) which connects to Khajuraho three days a week (Monday, Wednesday and Saturday). There is also a direct train from Jaipur/Udaipur to Khajuraho (“Udaipur Khajuraho Express” train no. 19666) which runs via Agra, Gwalior and Jhansi. If you come from any other major city you will have to change train in Jhansi (175 km away from Khajuraho) or in Mahoba (65 km) and take a train (or bus or taxi) from there. Alternatively, you can take a train to Satna (115 km from Khajuraho), but there is no Satna-Khajuraho train so you will have to reach Khajuraho by bus or taxi, which takes 4-5 hours. Khajuraho is well connected with many cities in and around Madhya Pradesh by road. The road to Khajuraho is connected to National Highway Number 75 and is easily accessible from all across the country. Both state transport and private operators provide ordinary, semi-deluxe and deluxe buses travelling to Khajuraho. Private taxis and coaches are also available. Khajuraho has a domestic airport known as City Airport Khajuraho, located 2 km south of the town centre. At present only flights from Delhi, Agra and Varanasi operate for Khajuraho. Arrival and departure are usually scheduled in the afternoon.